Mission Statement: NIBC was founded on the guiding philosophy of giving students from any background & geography a merit-based opportunity to develop and measure their skills on a global stage with the top talent entering the industry. Competitors are expected to submit a Valuation & Corporate Strategic Review that would match the expectations of a real-life corporate client (First Round) and pitch a Transaction Advisory Mandate to a corporate board looking to hire a financial advisor (Final Round). To continuously raise the standard of the competition, the Organizing Team provides instructions, templates and preparation resources to competitors each year through the online competitor portal (NIBCLive.com), which are designed to match the tools available at investment banks. NIBC also creates an environment that encourages graduates and professionals to build a high-quality professional network in different locations as they start out their careers with many finalists having gone on to work for some of the most recognized names in the industry. The Present: The NIBC 2018 Organizing Team would like to cordially invite you to participate in NIBC 2018 and build a network of likeminded high-caliber peers. Every year, the student organizing team collaborates with board and past NIBC team members in New York, Toronto and Vancouver to create a unique competition experience that matches the professionalism of the industry as closely as possible. 2010-2015: In 2010, Don Lindsay, former head of CIBC Capital Markets and President & CEO of Teck Resources accepted an invitation to give the keynote address at the annual Gala Dinner, becoming the first in a line up of leading industry representatives: these included the Global Heads of Investment Banking at RBC and TD, the Vice Chairman of Investment Banking at JP Morgan and prominent business figures such as Peter Brown (CanaccordGenuity), Brett Wilson (FirstEnergy, Dragon's Den), Robert Herjavec (Shark Tank) and Frank Giustra (Yorkton Securities, Lions Gate Entertainment) among others. Since inception, the NIBC team maintained its core principle of developing cases based on realistic transaction opportunities using fully authentic and current market data. As such, the Case Committee applied the same rigor used when advising external investment banking clients to presenting final case materials to the NIBC Board and Senior Managing Directors adjudicating the Final Round. In 2012, a handful of US schools first expressed growing interest in participating in NIBC. In 2015, NIBC attracted over 1,400 competitors from more than 100 universities as the largest investment banking competition globally with over 40% from the US and 15% from outside of North America. National: In 2009, a team of former UBC classmates directed by Philip Chua (1st year Analyst), Dipak Kamdar (4th Year) and Amardeep Chandi (2nd Year) established the First National Investment Banking Competition by forming a board of senior investment banking professionals with the crucial support of Tracey McVicar, now Head of CAI Private Equity. Although the first event attracted only two finalist teams from the East Coast, the push for a national event was motivated by the desire to give students in less finance-heavy geographies an opportunity to measure their skills with their top counterparts and be recognized by the professional community. 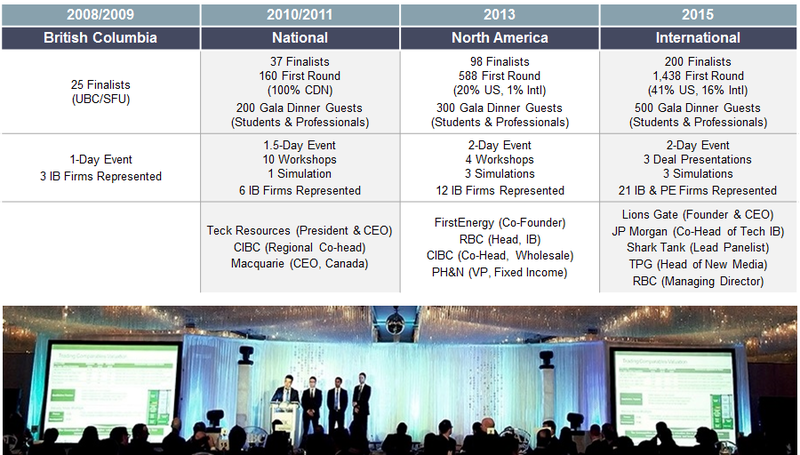 NIBC Origins: The impetus for a formal investment banking competition came in 2007, when Macquarie Capital invited a handful of students at the University of British Columbia (UBC) to provide perspectives on financing a mine project. The following year, a similar event was organized with the support of two additional banks adjucating 4 pre-qualified teams of 16 students.